In today’s fast-paced globe, marketers would prefer not to spend time on mundane and repetitive tasks. Therefore, automation could streamline marketing processes. Businesses need to vie for dropping direct human involvement, hence saving lots of time. If this is the requirement of the hour for your business, then all you should know about marketing automation is right here. Marketing automation is an influential solution that permits rising businesses to scale by automating, streamlining and analyzing their marketing tasks to facilitate capture leads with the least manual involvement. However, this clarification is rather not complete as it doesn’t consider that marketing automation also increases sales. Knowing precisely how it moves the needle for your business is the core to running successful marketing automation campaigns. What used to be the best platform is becoming more conventional now, which means marketers need to ensure they are moving from automation to engagement marketing to stay on the edge and be competitive. Marketing Automation software will automate all necessary marketing actions that direct a lead down the conversion funnel. It saves the marketer lots of time, therefore enabling him to focus further on the marketing strategy, in its place of just performing tasks. The main aim of marketing automation is to facilitate marketer’s better direct customer relationships by automating actions, for instance, social media posts, email sends and contact lifecycle stage changes. It is a comparatively young market but it’s intended to become a staple of every marketing team’s strategy. Marketing Automation has emerged as one of the main trends in B2C (Business to consumer) businesses. These days, marketers understand the importance and the requirement for automation. So, investments in marketing automation tools have risen over the previous years. According to some stats, the marketing automation software market will develop at a speed of 8.55%, reaching a market capitalization of approximately $5.5 billion by 2019. In recent studies, it has been found that more than 51% of businesses are using marketing automation strategies and 58% of B2B companies are planning to utilize it. Thus, you can visualize the rising need for marketing automation. If your business team has not yet adopted a marketing automation platform, let’s take a look at some reasons why it’s an investment worth making these days. There are many benefits businesses can get from marketing automation. But here we have summed up the most important ones to provide you with a better idea on this trendy topic. » Increase Productivity: Approximately 74% of marketers feel that the major benefit of automation is that it saves time, which leads to the optimization of productivity. » Generate more revenue: The other benefits of marketing automation are an increase in revenue and conversion of leads. 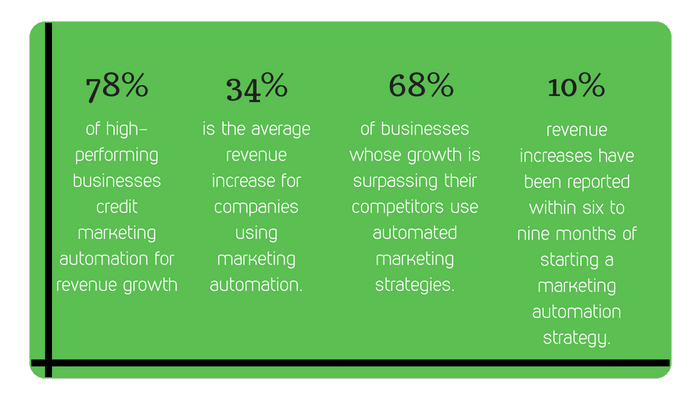 Almost 90% of businesses who are using marketing automation software feel that it has been valuable for their business. Business to consumer marketers who make use of these strategies has seen 50% high conversion rates. » Improve Customer Experience: An important benefit of marketing automation is that it helps businesses improve their customer experiences, as response time decreases and customers feel more engaged and personalized. » Reduce Error: When it comes to using marketing automation, there are fewer chances of error happening. So, it reduces errors caused by humans in the marketing processes. » Customer Retention: Around 69% of B2B marketers employ marketing automation for client acquisition and 50% for retaining them. It can offer significant insights into their performance and forecast their requirements which affect decisions. » Measuring and Tracking: Data and reports help you to find out the success rate of campaigns and take required actions. Businesses that use marketing automation tools can track their content marketing strategies three times enhanced than those who do not. This may look like a clear point to make, but before you do anything else, you have to decide exactly what you want marketing automation to assist you to attain so you can plan your strategy consequently. Trying to generate more leads? Trying to boost sales during an offseason? Working to increase business from return customers? Each of those objectives is going to need a different strategy, so it’s significant to understand exactly what your main objectives are. Obviously, it’s significant to understand the needs of your customers at every point of the conversion procedure. But depending on what your most important objectives are, your time and energy might be best spent focusing on people who are at an exact point in the process. For example, if you aren’t actually having an issue with lead generation but you would like additional people to convert, your time and energy possibly better spent focusing on the middle and lower parts of the conversion funnel. By using marketing automation, you’re trying to get people to take some type of action. Mapping user flow is a method to imagine the steps people need to experience to be able to take that action. Depending on the way a user arrives at your website, some people may need more information than others before they are willing to take that action. You do not want to make people go through more steps that are not essential to do something, but you don’t want to hit people with a hard sell too soon, either. It’s important to remember that not all leads are necessarily equal in terms of quality. Your record of contacts is inevitably going to be a combination of people who are on the verge of buying, people who are still researching their options, and people who possibly won’t change, so it is not possible to create extensive messages that will someway appeal to all of those types of people. Rating your leads helps you understand exactly who needs further nurturing and who is ready to be handed over to a sales team. The interactions a person has had with your content and the actions they have taken on your website can be a reflection of how prepared they are to convert. A person who has out looked a pricing page is probably going to be nearer to purchasing than somebody who has just read a blog post on a website. A person who has visited a website numerous times over the course of some weeks is obviously more interested than somebody who has only visited one time or two times in the past year. Marketing automation software allows you to allocate values to certain actions and interactions so that it can calculate a score for that lead. However, marketing automation also allows you to segment your database of contacts to an extremely high degree so you can deliver messages to exceedingly exact types of people. For instance, when working with a B2B business, a marketer may want to target messages to people with certain job titles who work at businesses of a certain size. With B2C sales, a seller may want to segment their lists to provide special offers to people who have spent a certain amount of money with the company or send product recommendations to people who live in certain locations. Below, we will cover fifteen of the vital things you should know about marketing automation. We’ll highlight the things you’ll want to understand and watch out for as you choose the right marketing automation program for your business. The most significant feature of any good marketing automation software is its capability to track the movement of prospects across your variety of web properties. When you launch your marketing automation agenda, you put in a piece of tracking code to the back side of your website. Then, when a person comes to your website and completes a form you have embedded in your landing page, the marketing automation software adds a cookie to that person web browser. Since the person has taken the conversion action and his computer is now identified, each time he or she returns to the website, his or her visits will be tracked within the marketing automation program. Marketing automation can automate the following repetitive tasks: data processing of information collected on forms, managing calls to action (CTAs), generating conversion reports, etc. Complex tasks are easily delivered with correctness through automation. Generally, marketing automation includes grading components or lead scoring that helps you to determine where leads are in the purchasing cycle and how intimately they line up with your description of an “ideal” purchaser. According to stats, 80% of businesses engaging in marketing automation benefit from more leads. Qualified leads increased by an unbelievable 451%. Marketing automation programs are channel-agnostic in the sense that they can be used in a variety of marketing platforms that comprise email, Texting, SEO, CRM tools, and social media. Moreover, the platform serves as a central hub for several marketing activities, making the marketing professional’s life a whole lot easier. When you take all these several features jointly, the outcome is that marketing automation programs can considerably decrease the effort it takes to close up a deal. You can hone in your sales and marketing efforts on the latent customers that have previously demonstrated an interest in and engagement with your brand instead of treating each prospect similarly and, losing time on tire-kickers or window-shoppers in the process. Eventually, this makes your marketing program more efficient and more productive. Relationship marketing is a form of marketing with a focus on achieving high customer satisfaction scores, therefore better retention rates. Customers’ long-lasting relationships with a brand engender replicate sales and word-of-mouth promotion, which, in itself, is an influential marketing tool. Marketing automation tools permit businesses to personalize their relationships with each customer, each prospect, and each lead through pertinent strategies that comprise lead qualification, nurturing trigger campaigns, digital footprint analysis and lead scoring models, sales, and marketing alignment. By defining exact restrictions, a laser-focused listing of consumers can be generated to get a text or email designed particularly for them. Marketing automation tools could run email nurturing campaigns on your behalf that keep prospects aware of your business. But these are not just simple auto-responder programs. Marketing automation programs usually comprise a strong series of dynamic lists, email automation logic choices and segmentation rules that help you automatically adapt your messages to the prospects’ individual requirements. You might have access to “real time” lead monitoring characteristics that demonstrate you when visitors are finished exact actions on your web properties, depending on the marketing automation tool you choose. A number of marketing automation tools come with impartial tools that allow you to watch as these actions are taken while others send notifications when prospects take defined actions or strike certain scores. Either option you have access to, the benefit here is that you can take action as soon as you see a prospect demonstrating high levels of engagement. If, for instance, your marketing automation program notifies you that a prospect is presently on your website and viewing your pricing page, you can lift up the phone and call right away, while your brand is at the top of the prospect’s brain. Marketing automation software keeps accuracy. By automating, you can remove the one element that contributes to mistake, the human element. Whether it is spelling, number crunching or punctuation, humans get it wrong quite often. One digit or a single letter can mean a whole fail with something like email delivery. So make use of marketing automation tools so you can get it right. Maximize revenue potential through the value of marketing automation. An automated process saves both money and manpower as it makes the most of your resources. Industry research reports a potential of 50% more hot leads at a third of the cost. When it comes to using marketing automation tools, you don’t have to be a technology wizard to manage an automated marketing strategy. The majority of marketing automation solutions are designed like a template that directs the user through the process. Marketing automation delivers content consistently. Users and viewers turn into familiar to the content being posted on particular days, possibly even specific times during those days. Any number of reasons can dislocate a regular post that viewers have come to depend on. So this is where the marketing automation can help deliver the content consistently. When marketing automation program is properly executed, it can minimize the man-hours required to close sales, saving you not just the sales person’s salary, but his turnover costs, time off and benefits as well. Not only does this make investing in a marketing automation program more competitive from a cost perspective, your new software will never take a sick day on you! Marketing automation will keep on growing as per present business trends. So, 2019 will be all about building engaging and unique experiences that comprise more value to the evolved, always-online consumer, super-connected and marketing automation will work as a means in making it all take place. Marketing automation tools will save time, increase efficiency and make sure a seamless workflow. It will offer you potential data management abilities to know and serve the market in a better way. A marketing automation strategy depends on your needs and considering your growth and business objectives. After reading this far, you still think marketing automation might be right for your organization but it’s very important to select the tools that best suit your business and reap benefits with time. This entry was posted in Automation, Marketing and tagged B2C, marketing automation.